Climbing Mt Damavand, 5671 meters, Iran's highest and most prominent peak, can make a lifelong memories. The mountain itself may look more attractive from away than close up, but the views on clear days and the experience of climbing with a group of equally minded climbers from around the world are very rewarding. If you intend to ascend Damavand Iran for the first time, you better to start with the simple abc information which leads you to more detailed in other pages. A- You should know some information about this giant Volcano, the Routes and Camps. You need a good Timing and good weather condition. An experienced guide or coach is very helpful and increases you chance of success. Visit also Damavand Weather Forcast. 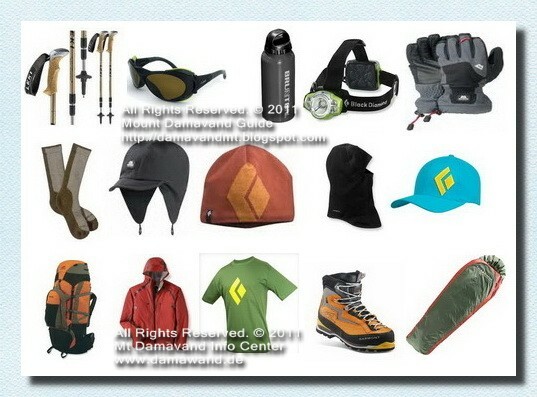 B- Proper Gear & Equipment, ordinary and basic equipment is enough for a summer climb. Plus some food and drink. C- You should know, How to Climb, Acclimatization, when to start, when to rest. The ascent to the summit is not technical and does not require major climbing skills but you need a good physical fitness, the main challenge of the climb is acclimatization and the fact that the air gets thinner as you gain altitude. More in How to Climb Damavand FAQ. Mount damavand has 16 Routes, 4 of these routes ( south north east and west ) are popular, each with a shelter at about 4000m. The north face has an extra shelter at 5000m, the most popular side is the south face, most climber start their ascent to the summit from south route. It is easily accessible from Tehran or north of Iran, the short way from Tehran through Haraz main road make southern approach best Trail. This is by far the easiest and the best side, the ascent to the summit is also shorter. Damavand Camp3 New Hut FAQ. The rocky, steep terrain in some sections and the potential of sudden, strong wind gusts are reasons to bring proper hiking shoes . Bring proper protection against low temperatures and strong winds. It is usually below zero at the summit, and strong winds often make it seem even colder. Bring rain gear, as weather conditions can change very quickly in the mountains. Gloves are recommended both against the coldness and for hiking the steep, rocky passages. The human body requires some time to adjust to a sudden increase of altitude, otherwise there is a risk of headache, dizziness and nausea. Quite a few people, who climb mount damavand, fall victim to altitude sickness. To avoid altitude sickness, you are advised to tackle the mountain at a slow pace and make frequent breaks. An overnight stay at Bargah Sevom Camp is recommended as opposed to a straight climb to the top. There are no bottles of oxygen, available at mountain hut, you may bring your own as an effective tool in preventing and fighting altitude sickness. Trekking und Klettern Damavand Berg im Iran. Alpenländischen Stil Bergsteiger- und Klettertour 2015 bis Alborz und Zagros-Gebirge. Iran Mountainbike und Abenteuer Radtour. Outdoor-Tourismus-Aktivität, Alborz Wandern Trekking-Touren. Erholungstour oprator in Teheran, Tourismus und Bergführer basiert. Reiseführer, Skitouren und Snowboardexpeditionstouren . Bester Abenteuer Outdoor-Aktivitäten und Wildlife Tour Veranstalter. Mountains Fotoalbum, Fotogalerie und Video-Clips. Damavand Foto. Trekking Damavand Iran, alpenländischen Stil Bergsteigen, Klettertouren. Trekking and Climbing Damavand Mountain in Iran. Alpine style mountaineering and climbing tour 2015 to Alborz and Zagros Mountains. Iran mountain bike and adventure biking tour. Outdoor tourism activity, Alborz hiking trekking tours. Recreation tour oprator based in Tehran, tourism and climbing guide. Travel guide, ski touring and snowboard expedition tours. Best adventure outdoor activity and wildlife tour organizer. Mountains photo album, picture gallery and video clips. Damavand Photo. Trekking Damavand Iran, Alpine style mountaineering, climbing tours. 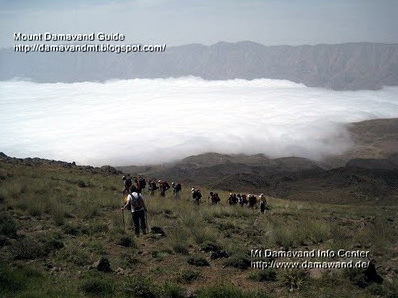 Trekking y Escalada Damavand Montaña en Irán. Montañismo estilo alpino y la escalada gira 2015 de Alborz y las montañas de Zagros. Irán bicicleta de montaña y rutas en bicicleta aventura. La actividad turística en el exterior, Alborz excursiones de trekking. Gira Recreación oprator sede en Teherán, el turismo y guía de escalada. Guía de Viaje, esquí de fondo y de la expedición de snowboard excursiones. Mejor actividad al aire libre aventura y gira la vida silvestre organizador. Montañas de álbumes de fotos, galería de fotos y clips de vídeo. Foto Damavand. Trekking Damavand Irán, montañismo estilo alpino, escalada tours. Randonnée et l'escalade Damavand Montagne en Iran. Alpinisme style alpin et l'escalade tournée 2015 à Alborz et Monts Zagros. Iran VTT et visite aventure à vélo. Activité de tourisme de plein air, visites Alborz randonnée de trekking. Loisirs Tour oprator basé à Téhéran, le tourisme et le guide d'escalade. Guide Voyage, ski de randonnée et snowboard expédition visites. Meilleur activité de plein air d'aventure et visite de la faune organisateur. Montagnes d'album photo, galerie de photos et de clips vidéo. Damavand Photo. Trekking Damavand Iran, l'alpinisme de style alpin, escalade. Trekking e Arrampicata Damavand montagna in Iran. L'alpinismo in stile alpino e arrampicate giro 2015 Alborz e Monti Zagros. Iran mountain bike e tour di avventura in bicicletta. Attività turistica Outdoor, Alborz tour escursioni di trekking. Ricreazione Tour oprator con sede a Teheran, il turismo e la guida di arrampicata. Guida di viaggio, sci alpinismo e snowboard spedizione guidate. Miglior attività outdoor avventura e tour della fauna selvatica organizzatore. Montagne photo album, galleria di immagini e video clip. Damavand Foto. Trekking Damavand Iran, l'alpinismo in stile alpino, arrampicate. Trekking og Klatring Damavand Mountain i Iran. Alpin stil fjellklatring og klatring tour 2015 til Alborz og Zagros. Iran terrengsykkel og eventyr sykkeltur. Utendørs turisme aktivitet, Alborz fotturer trekking turer. Rekreasjon tur oprator basert i Teheran, reiseliv og klatrefører. Reisehåndbok, skiturer og snowboard ekspedisjonsturer. Beste eventyr utendørs aktivitet og dyreliv tur arrangør. Fjellene fotoalbum, bildegalleri og videoklipp. Damavand Photo. Trekking Damavand Iran, Alpine stil fjellklatring, klatreturer. Треккинг и альпинизм Дамаванд гору в Иране. Alpine альпинизм стиль и восхождение тур 2015 на Эльбрус и Загрос гор. Иран горный велосипед и приключения велотура. Открытый Туристическая деятельность, Эльбрус Туризм треккинг туры. Отдых тур oprator базируется в Тегеране, туризма и скалолазания руководства. Туристический путеводитель, катания на лыжах и сноуборде экспедиции туры. Лучший приключенческий мероприятия на свежем воздухе и тур дикой природы организатором. Горы фотоальбом, картинная галерея и видео клипов. Damavand Фото. Поход Дамаванд Иран, в альпийском стиле альпинизм, скалолазание туры. Trekking i al'pinizm Damavand goru v Irane. Alpine al'pinizm stil' i voskhozhdeniye tur 2015 na El'brus i Zagros gor. Iran gornyy velosiped i priklyucheniya velotura . Otkrytyy Turisticheskaya deyatel'nost' , El'brus Turizm trekking tury . Otdykh tur oprator baziruyetsya v Tegerane , turizma i skalolazaniya rukovodstva. Turisticheskiy putevoditel' , kataniya na lyzhakh i snouborde ekspeditsii tury. Luchshiy priklyuchencheskiy meropriyatiya na svezhem vozdukhe i tur dikoy prirody organizatorom. Gory fotoal'bom , kartinnaya galereya i video klipov. Damavand Foto. Pokhod Damavand Iran, v al'piyskom stile al'pinizm , skalolazaniye tury .